Click here To sign up for the Bill Nash Giglist email... I'd love to see you all out at a gig soon!! Click here To sign up for the Camp Nashbill email list, which is my camp down at the Kerrville Folk Festival every year! Shubb capos are the way to go! I got to perform on the main stage at the Rocky Mountain Folks Festival in Lyons, Colorado August 17, 2003 with 3 of my fellow song schoolers (Christopher Smith, Jenny Bruce, and Stephanie Corby)!! Steve Szymanski (the guy who coordinates the song school) asked me early on Saturday during the festival if I would like to participate in a song school circle on the main stage Sunday morning, and of course I was beside myself with yesses!!! It was huge fun and an hour I won't ever forget, I even got to do my "Colorado" song for the Colorado audience!! 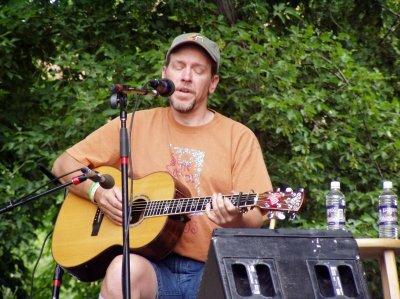 Here's me on mainstage at the Rocky Mountain Folks Festival 2003 (taken by my old friend Joseph Leavell)!! Also, big thanks to all who voted for me as "Audience Favorite" at the 2003 WildFlower Festival Songwriting Contest (and again to be chosen in 2006)... way cool, and the festival is always a blast!! -- The Kerrville experience is always coming up again, looking forward to 2013 and many more great Camp NashBill experiences!!! Welcome to the Putsie Cat Records webpage!! I have been a musician all my life, starting at a very young age (5 years old as a boy soprano) and with an all-consuming passion of wanting to make music for the rest of my life. Over the years, I have also turned to songwriting and love to spin a story inside a song! I have 3 CDs available, the first called "Mostly True Stories" (1996), another called "Runs With Scissors" (1998), and the new CD "Dreaming Again" (2010). The 3 CDs have 37 of my own songs recorded on them and 3 cover tunes of a few of my favorite songwriters. 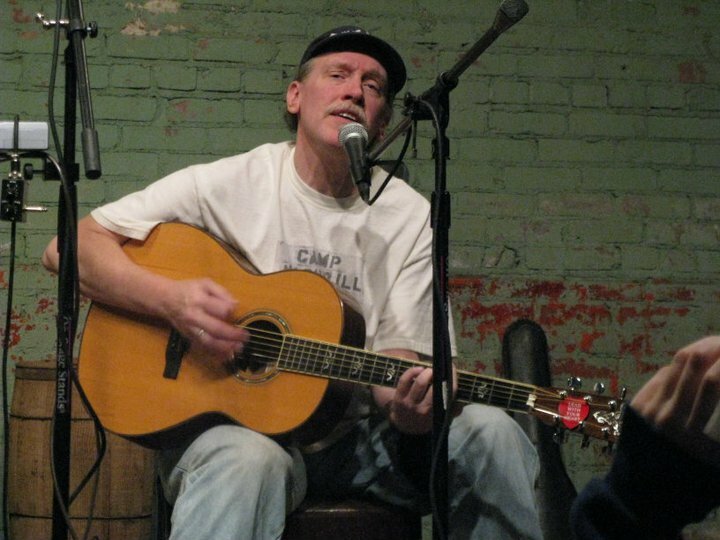 Many people consider my music folk music, and stories of life and love are my specialty... I attempt to tell stories ala Harry Chapin, although I can only hold a candle to the master!! Here are some pictures taken by friends all over the country! Since 1988, I have been dealing with the vagaries of Multiple Sclerosis, and the last few years have been the worst, with increasing numbness in my left hand taking away some of my guitar ability. But after playing the guitar for 4+ decades, my fingers still know where to go, I just have to look at them more and remember to push harder, so I'm still playing and of course I'm still singing and writing! Actually, one of the more creative/fun things I've been doing lately is to change some of my old songs to other tunings to make them 1 and 2 finger chords instead of 3 and 4 finger, and it's allowing me to play several songs I thought I might not be able to play again! I have been on disability from my real job (Raytheon/TI) since February, 2004. The disability company does not allow me any income beyond my long term disability income... so, it makes for an interesting mercantile situation! Drop me an email and we can work out some of the details... or better yet, go on CDBaby.com and order my CDs from there! I still donate a portion of the proceeds to MS charities! Listen to my sample MP3s! And last (but not close to least!)... the "Putsie Page"